Watches. Obsession to some and a simple way of telling the time to others. One interesting thing about this particular obsession is that it exists equally at all the potential price brackets with people prizing cheaper, novel or outlandish watch brands just as much as the international household names. There are celebrity endorsements of almost all brands and a lot of time and money is made to convince us that these products offer us something over and above telling the time. Obsessions that you share with others can never be judged rationally as you lack the context needed to see them from the outside. In order to see them for what they really are you need an example of the same thing in a new context that you don’t obsess over. So, I am going to briefly mention watch obsession in the context of a different product operating on the same lines and I suppose the most direct market comparison I can make is with that of wine. Good wine, great wine. What is the difference? Take wine costing, say, £3 per bottle. This price is made up of £1 on the glass, 50p on the branding, 50p on the distribution and 50p for the company’s profit, which leaves 50p for the actual growing of the grapes! Now take a bottle costing £6. All the prices for glass, distribution, etc remain the same. However here there is up to £3 to spend on the grape growing. By doubling the price of the wine we have (potentially) increased the quality by 6! However, does this increasing of price continue to improve the quality? No, take wine costing £500 per bottle. Is that extra going into the taste? Or into the branding of the Chateaux? Is it going in someone’s pockets while pretending to be going into total intangibles, hidden behind buzz words such as “Terroir”? Expensive does not mean best; it only means that you bought the product for some other reason than any rational judgement of quality. The world of watches is just as crazy as that of wine. So, beyond a certain price to performance ratio you are gaining nothing tangible. How crazy you ask? Well there is a watch on the market for serious money that… doesn’t have a visible face. The watch is just blank and I don’t mean that the face is blank until you do something or press something. The watch has no way of reading time on it! You just listen to it ticking and imagine time passing! The perfect price / performance ratio, where quality and cost dissect I shall call the Golden Mean. It is the perfect meeting point of cost and performance. The intangible and unquantifiable element is that of style. 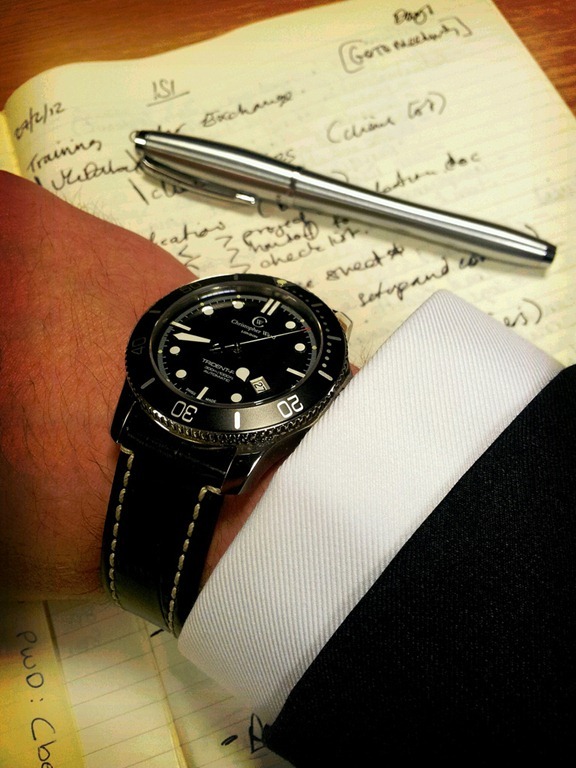 I was reading the other day of a man wearing a £40,000 watch (a Patek Philippe Nautilus). 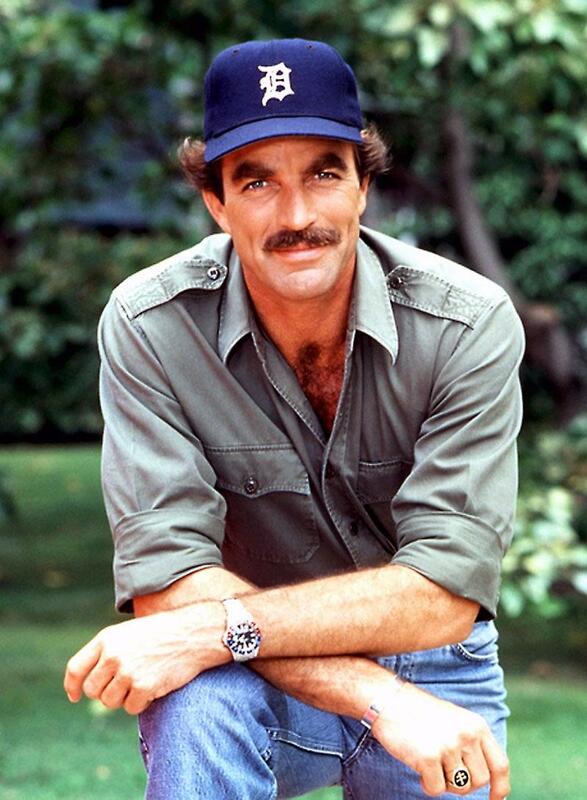 My wife and I wondered what would be the motivation of such a man to spend so much money on a watch. I realised that for this man this watch did not signify telling the time at all. He had bought this watch after successfully selling his first company; he was an entrepreneur and his watch was the way he let other people know this. Style is essentially personal. Each person’s style is unique to them. Some use it to signify membership of a certain crowd or clique. Others to signify that one is trying very hard not to be a member of any crowd, that one is an individual standing alone. For men, the ability to differentiate one’s self from others is not easy outside of purely financial and class based indicators. Suits, shoes – clothes – can do this, but suits can easily all look alike and few men wear suits all the time. This is why celeb’ endorsements work. We look to the rich and famous to “tell” us which brand is the best. This is all fine, except that most of the watches produced by this branding process seem to me to have little in the way of style. 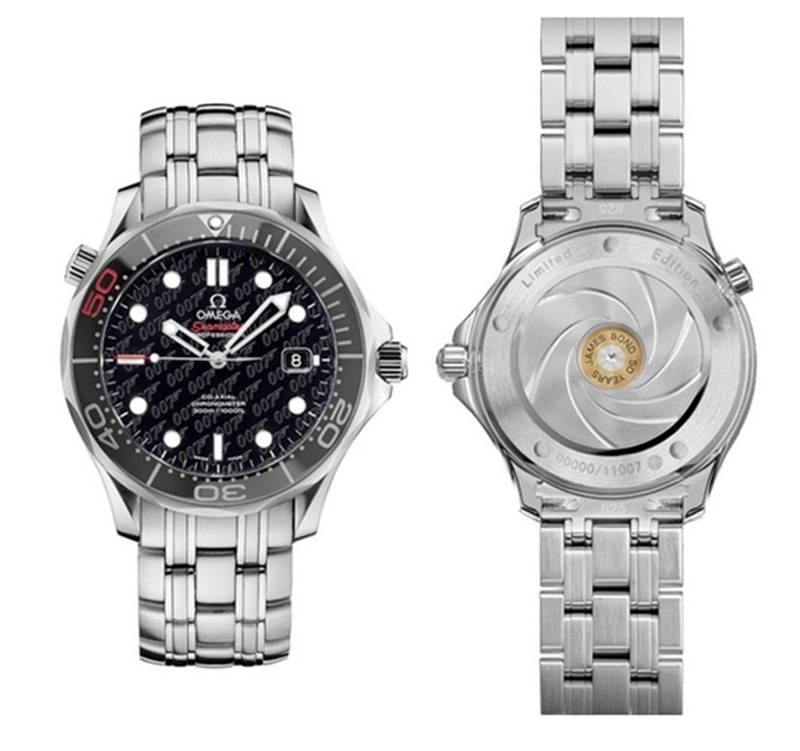 Take the Omega Seamaster produced for the latest “official” James Bond endorsement; never has a classic and elegant watch been so messed up by endorsement branding. For most men the only jewellery they wear is their watch. So it falls to this purchase, this one item, to mark them out and this urge is where watch obsession starts. I was on this journey many years ago. I stood in Goldsmiths with 3 grand in my pocket and considered the “top brands”. 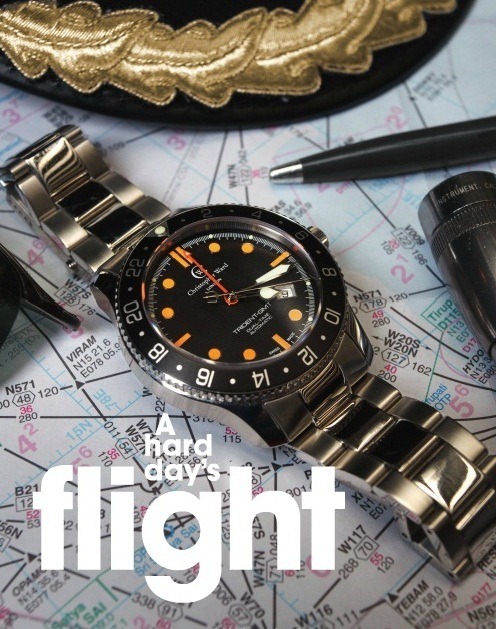 Rolex Milgauss, Omega Moonwatch, Blancpain 50 Fathoms and the Bell & Ross Top Gun. 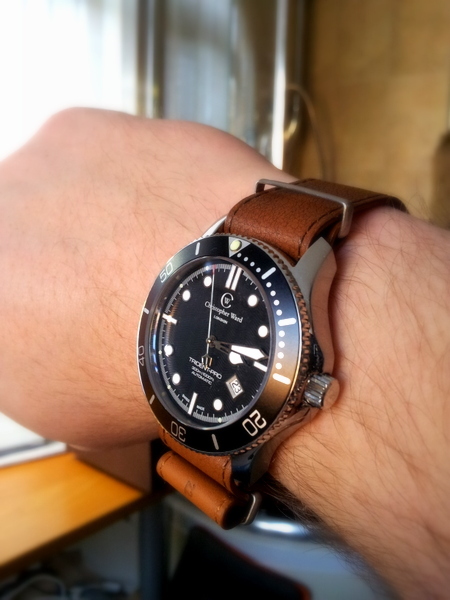 I was very close to springing for an Omega Seamaster when I decided to “sleep” on it. I was very glad that I did. That night I turned to the internet and found that there was another watch world outside the high street stores. A world where the Golden Mean still operated normally, a world that only exists on the computer until you hold it in your hands, a world of massive choice and quality. 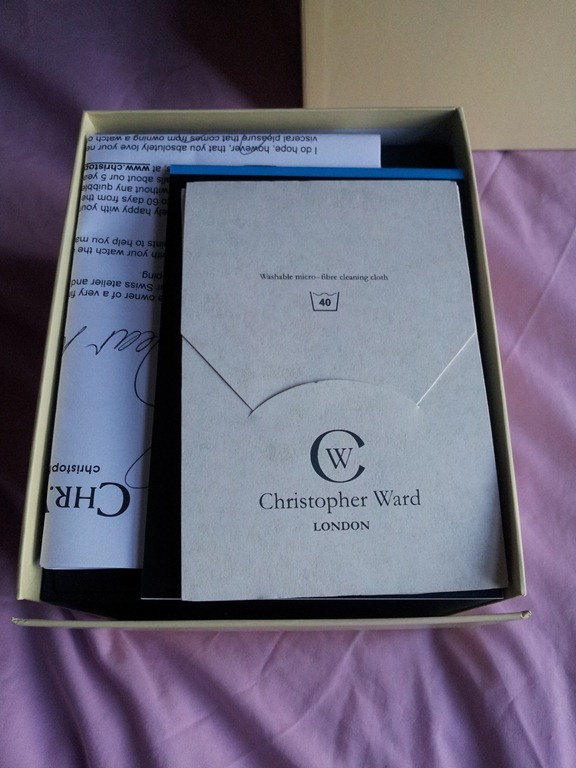 I had found the world of Christopher Ward. This review is of the Christopher Ward C60, but it is also an overview of the other watches in this bracket, a look at actually wearing the final watch choice, of strapping it to show it at its best and to show that you can buy a very good watch for not very much. Buying online seems like a risk, in both terms of quality and of style, and I hope that this review will help you take the plunge with a little more confidence. 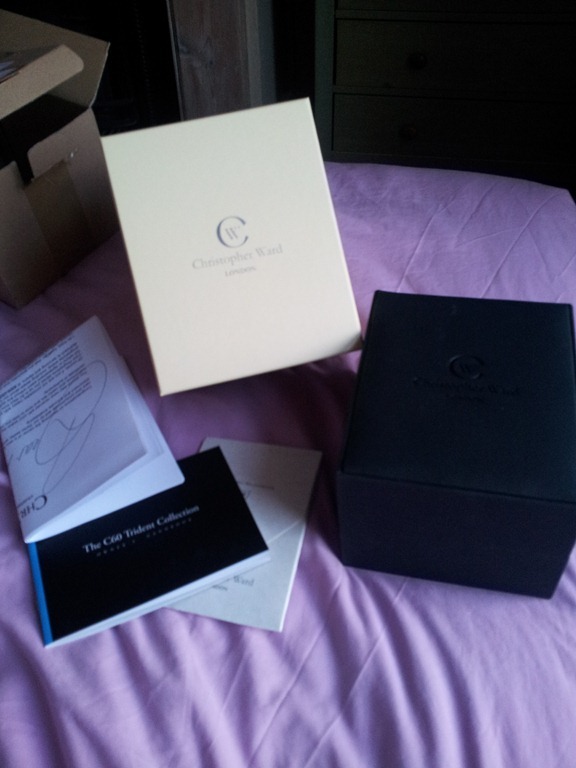 I am going to show you the “Terroir” of Christopher Ward and then amaze you with the price. £500 worth of wine for £6. Firstly, my reasons for buying a new watch. Downsizing. I was made redundant last year and needed to pay the rent to keep the roof over the head of my young family. So, I sold off my small collection of watches. Then I landed a new job and the pressure came off. So, I split the funds, giving half to my wife, and bought myself something new to wear to work. Style change. All my personal electronics, bag, shoes, etc are now black. I wanted a watch that complemented that. Watch quality improving. 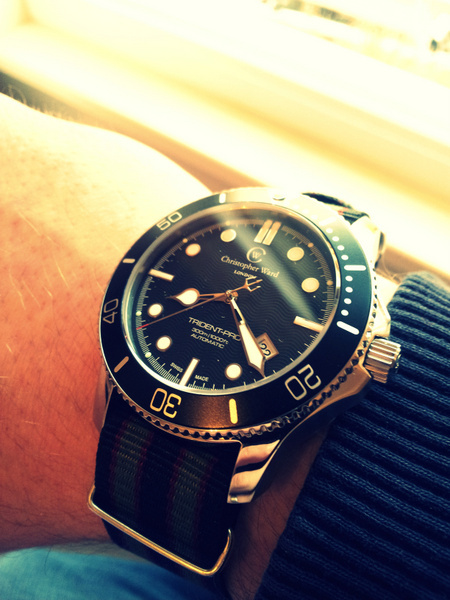 Over the last 3 years the quality of a sub £500 watch has improved considerably. 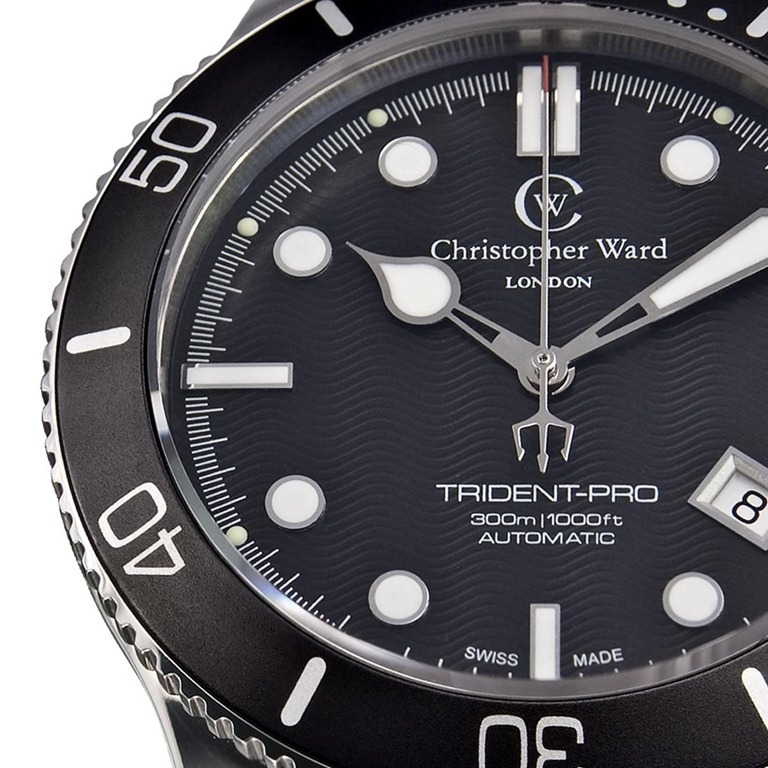 Christopher Ward is a watchmaker with a vision for Swiss watches: make them quintessentially British, but with the highest quality components. His works are only available online and to those in the know, spread by word-of-mouth and most definitely not by celeb’ endorsements. The company has been around now since 2004 and have turned the traditional model of hype on its head by making a luxury product for a cheap price. Following the Golden Mean to the letter. The cheapest most expensive watches in the world. 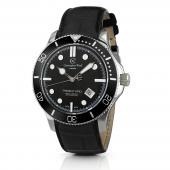 I have owned 5 Christopher Ward watches in my time and they have all been excellent. My past favourite was the Kingfisher diving watch that I took as my watch of choice on my year travelling around the world. Its build quality meant that it survived bungee jumps, skydives, 20 sea dives, Indian heat and dust, China’s highest heights and being slathered in DEET hiking the jungles of Thailand. Through all that it kept great time and never let me down. I regularly received compliments on the watch and its classic design, swiftly followed by open mouths when I pointed out how little it cost. The C60 is the “big brother” of the Kingfisher and I was expecting the same build quality from this design. I wasn’t to be disappointed! 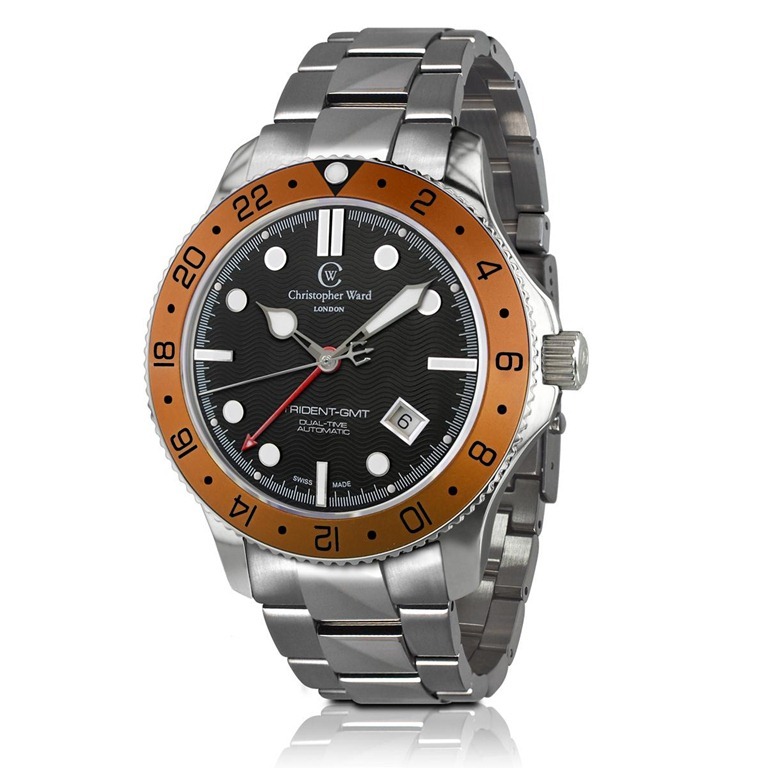 This watch comes in a number of flavours, including GMT versions. But I went for the lovely black bezel automatic model. 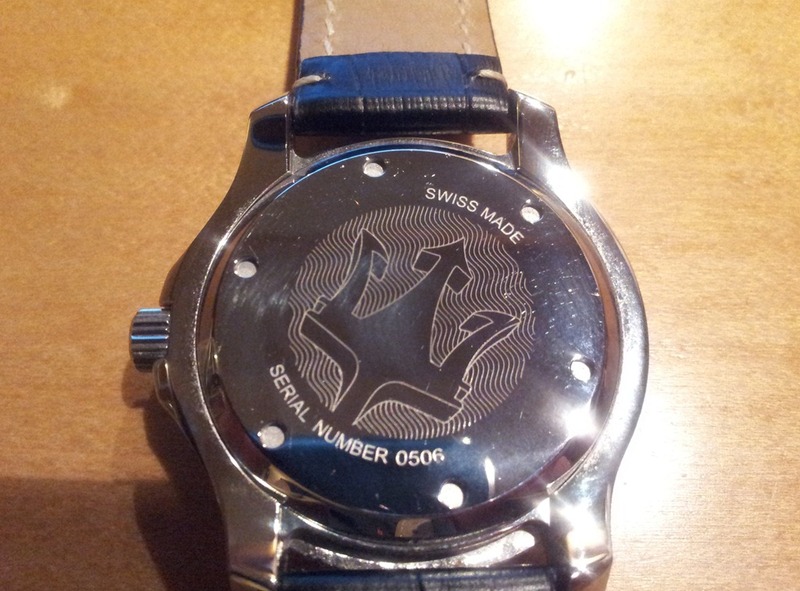 “Swiss made” means that the watch movement is Swiss, the movement was put in the case in Switzerland and that the final inspection was done in Switzerland. 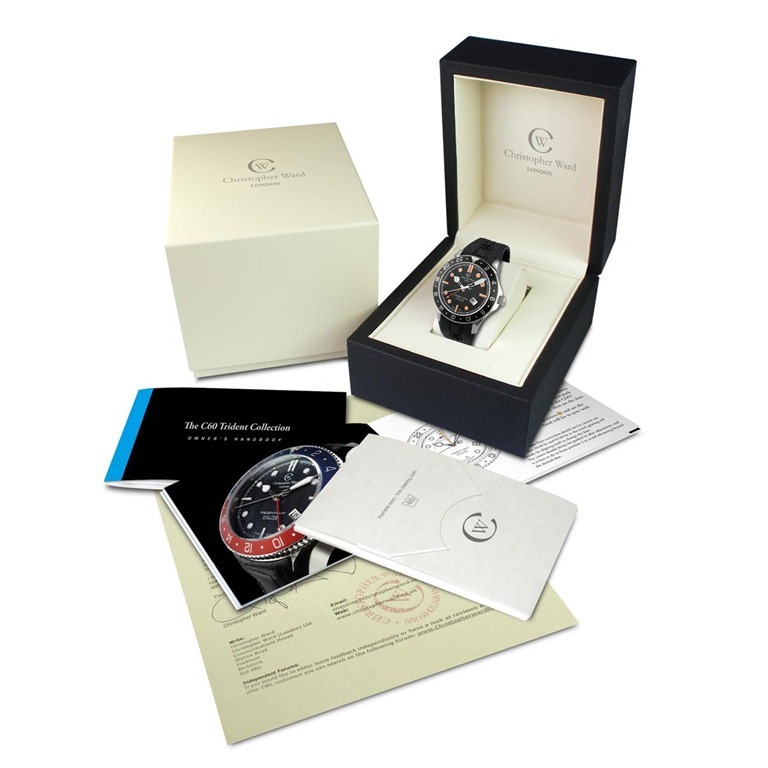 The Swiss watch industry is by far the world’s most famous and this is a mark of high quality. The second hand movement is smoother, not a clunky “tick”, which looks lovely. The watch makes a slight creak/winding sound when moved, which can be heard when holding the watch to your ear. While ETA movements are valued by watch “Otaku” higher than Stellia, actually given the Swiss’ attempts to tighten the market, it is going to be much easier to service the later movement in the future. Both are equal quality. One doesn’t like to focus on the guarantee for an item; the hope is that you won’t need it. But with most items sold in the UK having planned obsolescence built in (ever had something break just outside its 1 year warranty?) it is very special to have such a long guarantee on a watch movement. 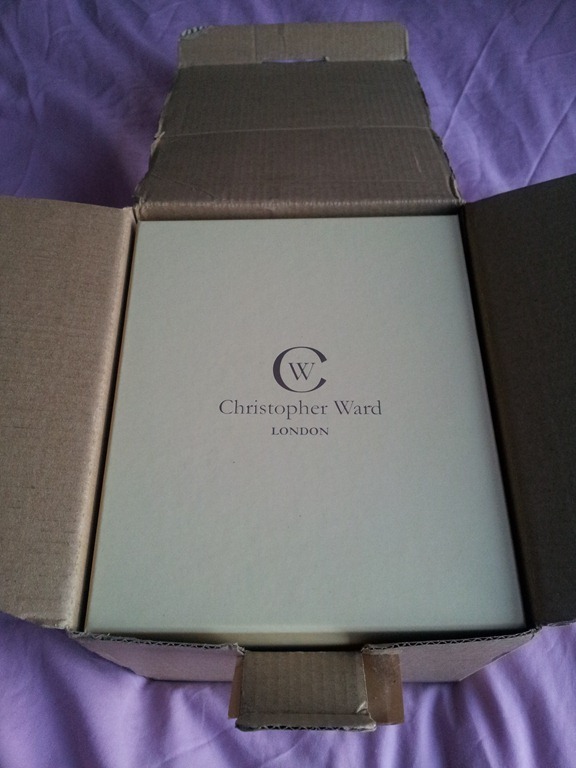 To buy from Christopher Ward is to invest in quality and for him to stand very firmly behind that. No other brand of the same class can offer this. This is how long the watch will wind before stopping if it is not moved. If you have a collection of watches then you can use a watch winder to keep it going. 38 hours is a good time. It also means that you shouldn’t need to wind the watch again before diving. The case on a watch needs to be strong and tough. Christopher Ward cases are just that. 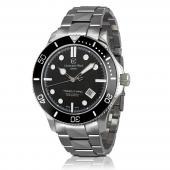 This watch features a polished effect on the face of the watch and lugs and a brushed effect on the rest. After 3 years of wear my previous Christopher Ward had very few scuffs and marks, showing that this watch was made to withstand tough use. The bezel on a dive watch is designed to back up your dive computer, not to replace it. However unlikely it may be that your computer will fail, it does happen and being 30ft under water is not the time to be wondering how long you have been out. The C60 is a quality instrument for this use. 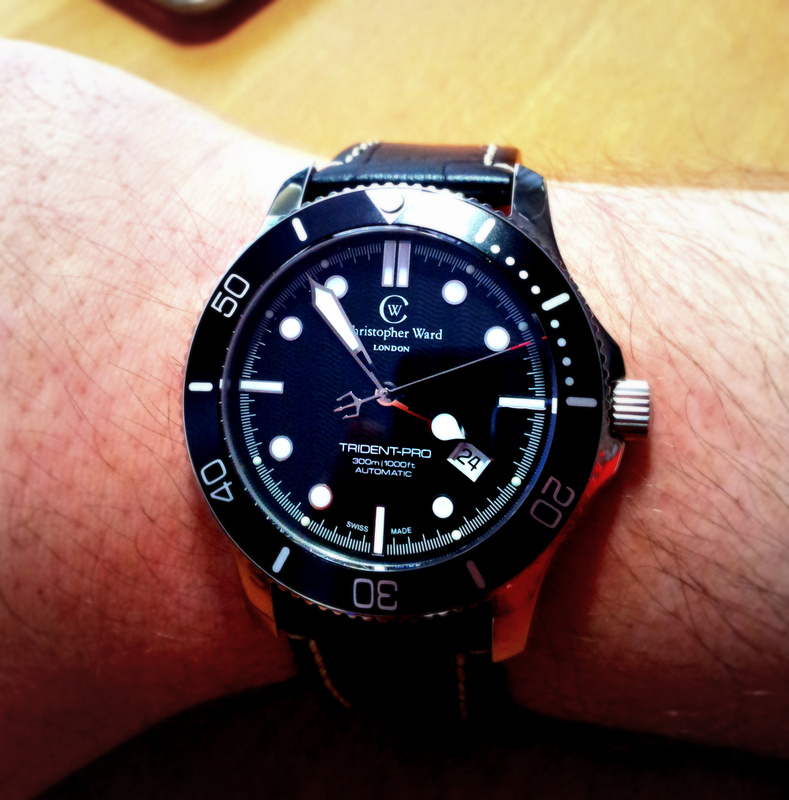 By turning only one way the bezel cannot accidentally move into a position that makes your dive anything but shorter. Some other makes have a bezel that turns both ways and this makes possible for the dive to go over. This may just cost you personally, medically and financially. 30 atm might seem a lot, but in dive watch terms this makes the C60 a watch for the diver at normal dive depths and this has been certified in the lab. 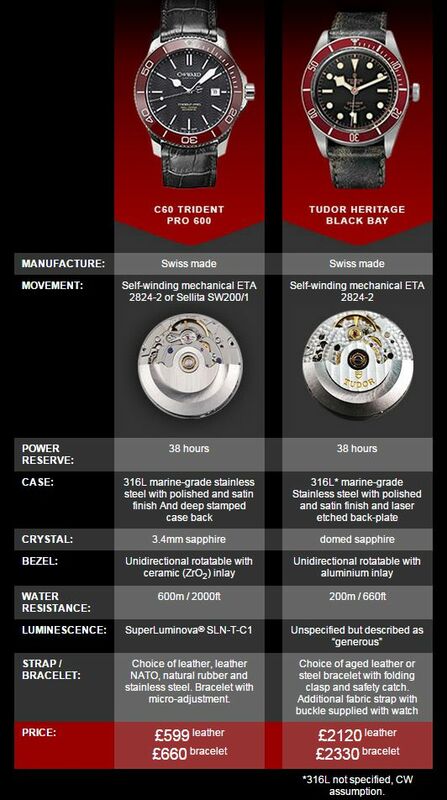 There are a lot of special ISO ratings for dive watches and the C60 reaches or exceeds all the recreational ones. The thickness of a dive watch’s glass is vital to its ability to survive under water pressures without the glass exploding off. Anti reflective coating means that the watch can be clearly read at all angles. Sapphire has a hardness of 9 on the Mohs scale of measurement, but in real terms very few materials can scratch it, and even less that you are likely to come in contact with (diamond is one). The material can be smashed with enough force, but that force is going to have to be very high and focussed on a very small area (E.G. using a hammer and tungsten nail). 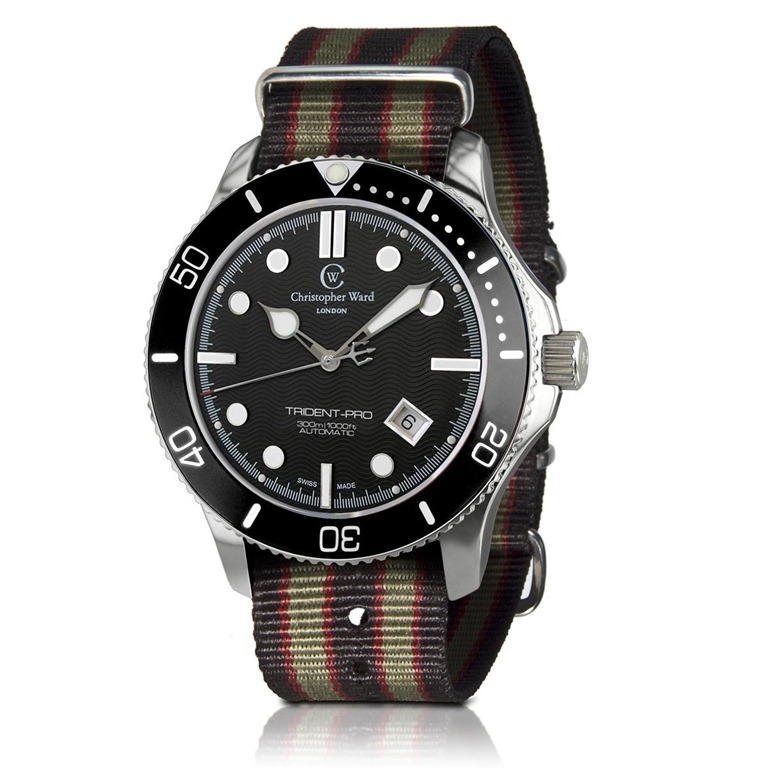 The model I bought comes with a James Bond NATO strap. Such straps are pure marmite and I will go into much more depth about strapping the C60 later in the review. 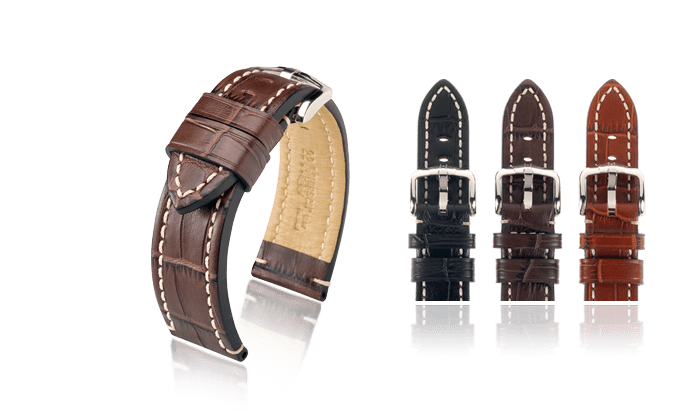 Suffice to say that I have owned all the Christopher Ward dive straps (rubber, nylon, leather and steel) and they are all of excellent quality. Some people go potty over lume, and want their watches to glow with lightsabres for hands. 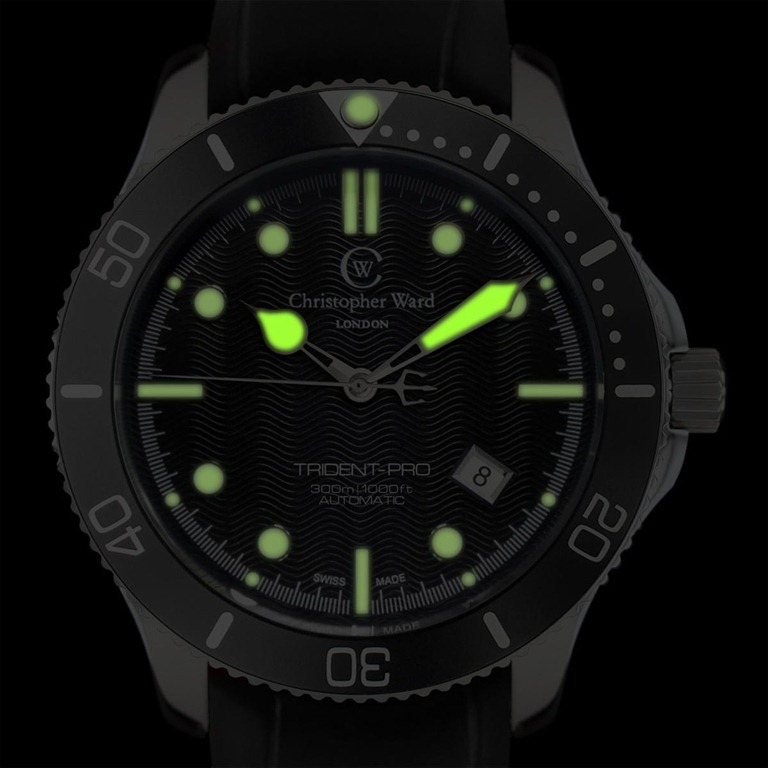 This watch has an elegant lume that is quite easily visible in the dark (after it has charged) and stays lit for a long time. Lume of this sort is brighter initially than GLTS, but over a couple of hour’s time it will fade where as GLTS is constant and readable all the time. Which you prefer is up to you, but having owned both I definitely prefer the Superluminova style. 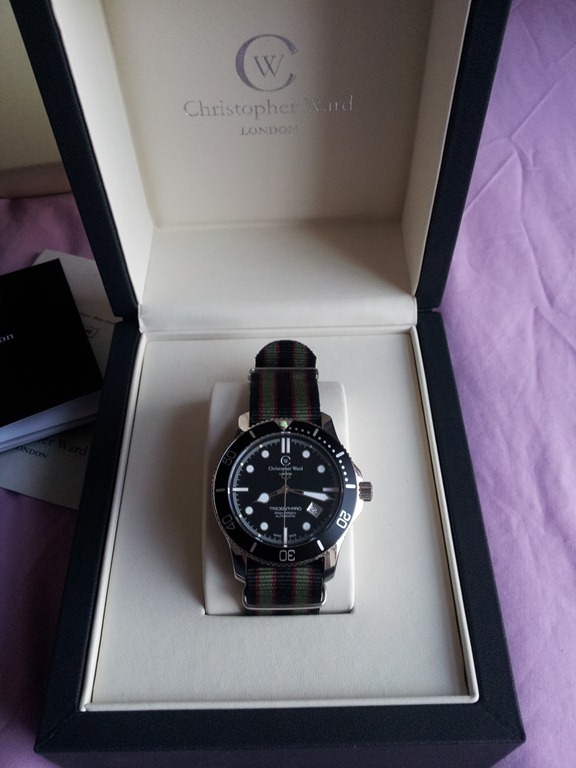 Christopher Ward watches are very collectible. I must confess to having made a profit on selling old CW’s. That is how much they hold their value. An investment in a CW is a good investment in something that has achieved long lasting charm and value. This is a manly watch for a man’s wrists. 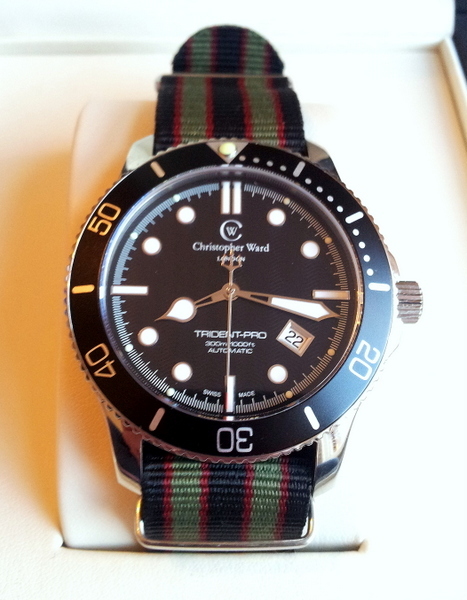 Christopher Ward does do thinner models, but the C60 is made for “real men”. One of the things that always amazes me is when I see peoples first reaction to Rolex as they are often much smaller than people thought that they would be. Not so here, this is large but not stupidly large (like some of the omegas I have seen). You could wear this watch with anything as I will show. As with diameter, this value is important for you to judge how the watch will look on you. 13mm is not very thick, but it isn’t thin either. It will go under a shirt with no problems. Another well balanced statistic. I have another dive watch that adds serious weight to my arm and I have actually bruised my arm by it swinging around. By contrast the C60 is weighted towards elegance. The Trident series unashamedly takes its design cues from the iconic 1954 Rolex GMT Master which was the world’s first ever dual-time watch – and the C60 Trident – Pro Automatic is no exception. 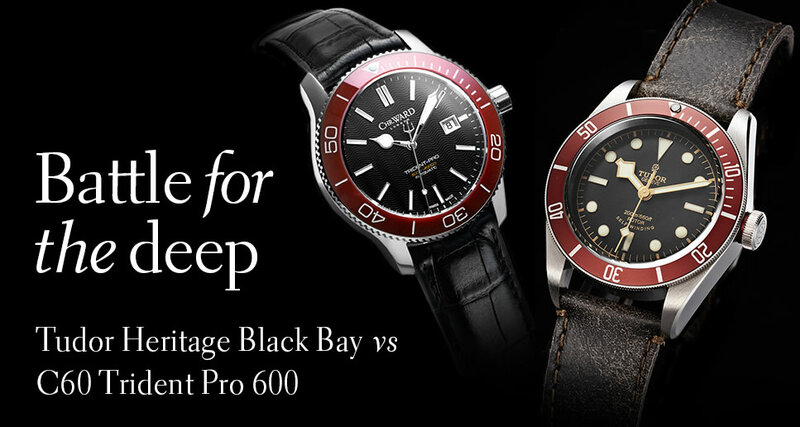 There are two schools of thought regarding homage to “classic” watches. The first says, “Bang on!” and won’t wear anything but a “pure” homage that is almost identical with the view that it is “all the quality without the price”. These are owners who don’t mind explaining to people that, “No, actually this isn’t a 10 grand Rolex, it’s a £350 homage…” Just keep in mind that you may end up trying to convince someone that your watch isn’t a “real” Rolex while they try and rob you with knives. And they won’t be impressed when you turn out to be right… (Of course you could do what Bond did in the “Live and Let Die” novel and use it as a knuckle duster!). I have a pure “homage” Steinhart watch that would fit this category. Thanks to the date position. Frankly that this watch can be mentioned in the same breath as two of the best designed watches of all time, while retaining its own sense of style, is bloody brilliant. It is truly a winner and its own brand, not just a cheap homage to “better” makers charging well over the Golden Mean. I have held and tried on all of the watches I have mentioned in this review (so far) and I can say that the C60 is not outshined by any of them. The face of a watch is the part you will be looking at the most. So it is really important to like it. 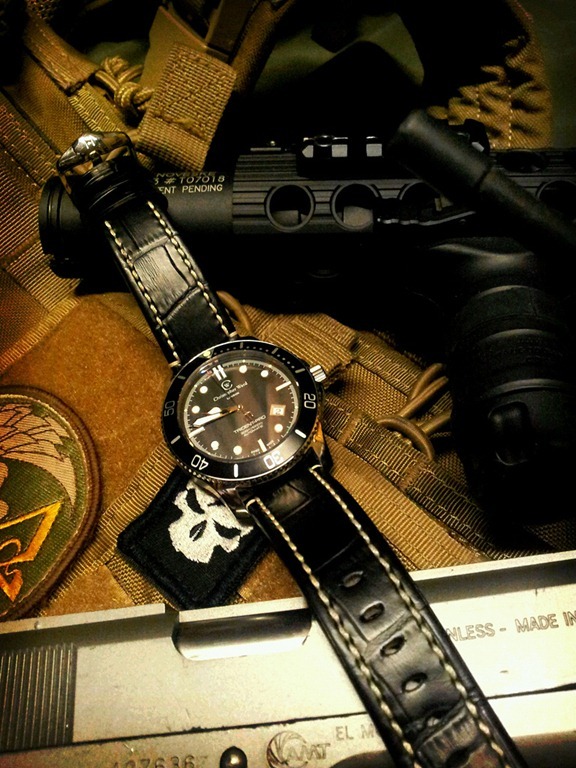 I have sent back watches before (the Traser H3 was one) because the face just didn’t inspire me when on the wrist. Being a dive watch, this face is open and focussed on being readable. I found it to be very elegant as did my expert-branding-consultant wife who, being fed up with my research into watches, wanted to hate it on sight. However, when she actually saw it for the first time, she stopped, took a moment, looked up a me and said, “Very nice”. 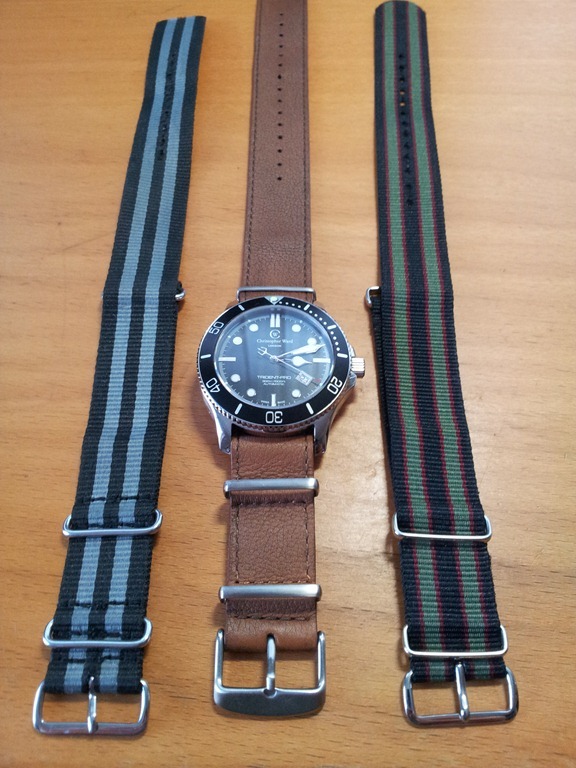 My C60 came with the NATO strap. 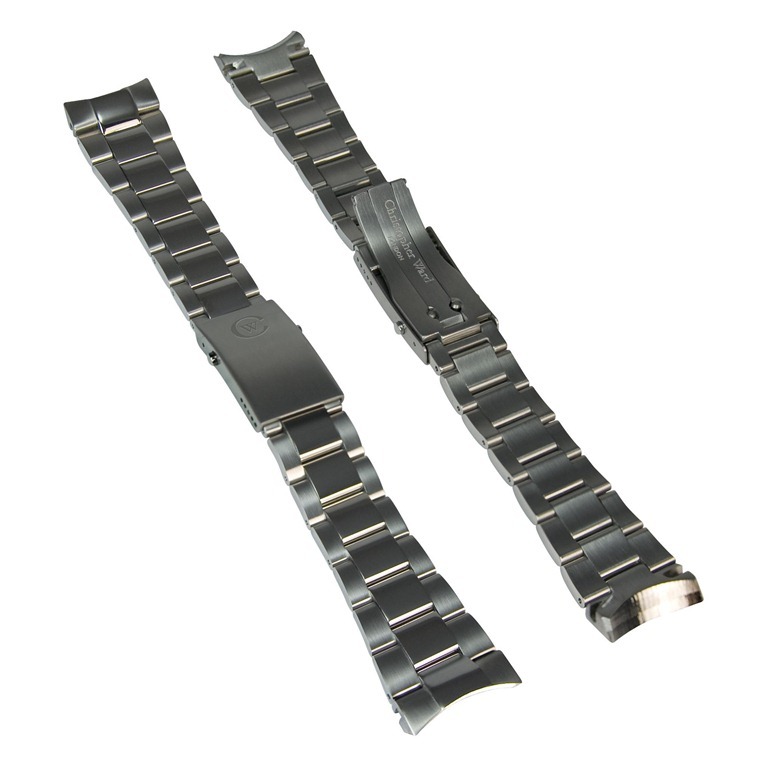 My large arms mean that I have on occasion had the metal CW strap pop open by my wrist pushing against the button when touching my fingers to my wrist. 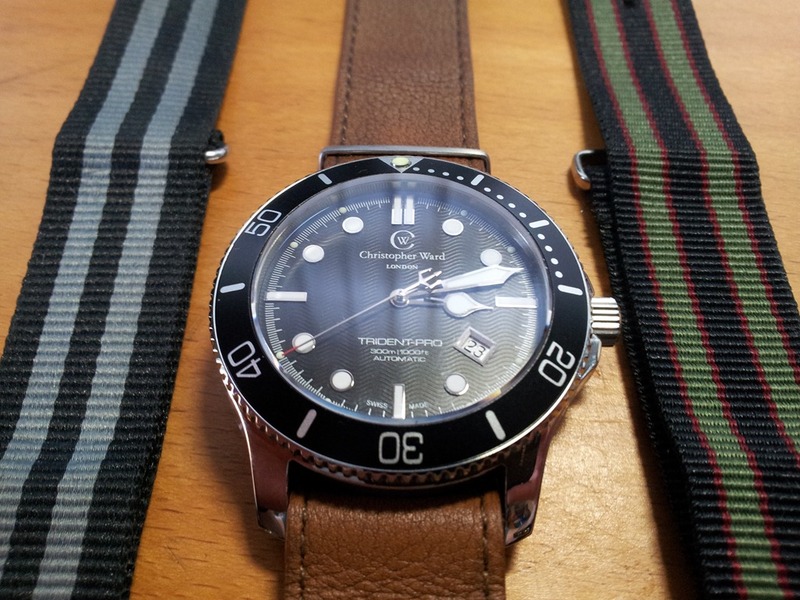 Since then CW has released a new strap type and I may very well get one in. 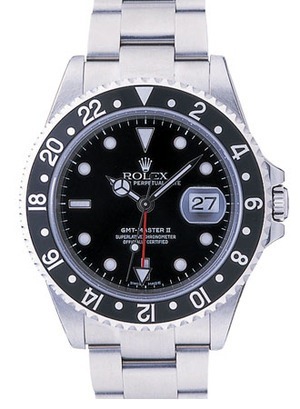 This was a special edition release in honour of James Bond, who wore the Rolex GMT in many a bond film. Bond is a marmite character like his choice of straps. After all he shoots people all the time, treats women abominably and, unlike myself (I’ve tried) can play cards after 6 Vespers. 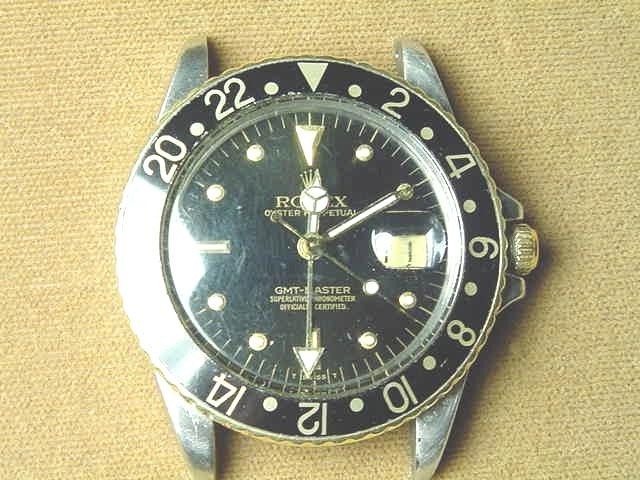 However, not only Bond wore the Rolex GMT. Ok, perhaps not so impressive, but he’s a cool manly guy. Too crazy? Try Marlon Brando. Too right wing, try Che Guevara. 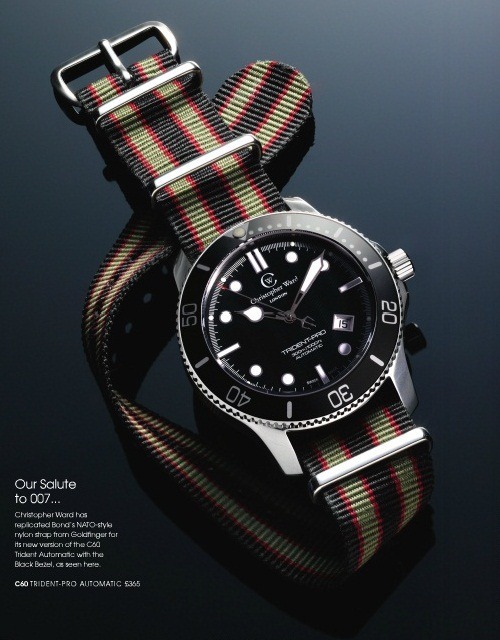 In other words, this style of watch is for everyone – not just divers! 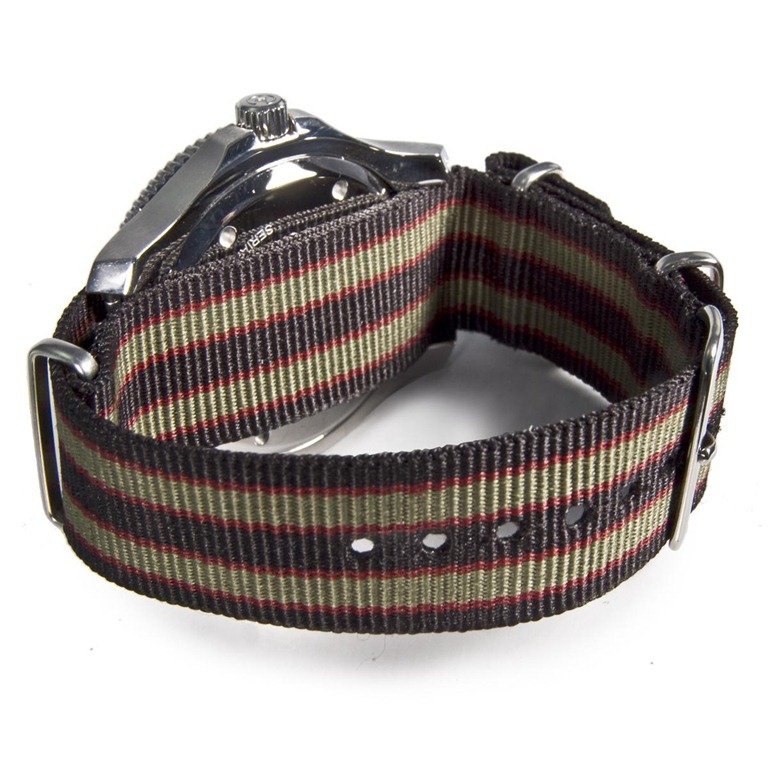 My wife loved the C60 on the NATO and I did too, I will definitely have it in “strap rotation”. The quality of the nylon means that it is never going to fall off and that the fit is going to be like a glove (even when over gloves). NATOs do sometimes need trimming to fit, which is something done carefully with a sharp knife, a metal ruler and (in my case) a crème brule blowtorch! Also note that a NATO can be scratchy for a month or so, until your sweat has weakened it, then it will become very comfortable to wear. They also eventually wear out and need replacing. Depends on your use, but always give them a wash in fresh water to clean off dirt and sea salt. 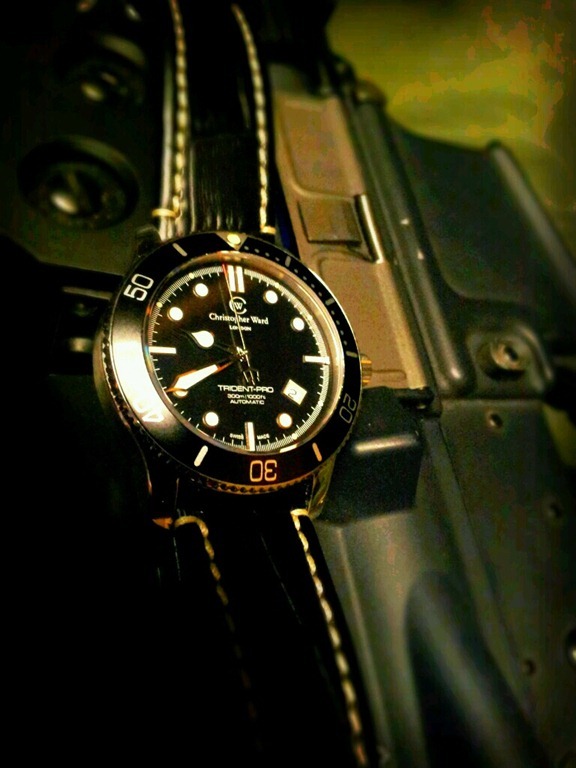 I also have another NATO, called a “Fake Bond”, on which the watch looks great too. Then, last in my NATO collection is a nice leather edition that is very soft and with a little polish (to be darker) looked rather nice. 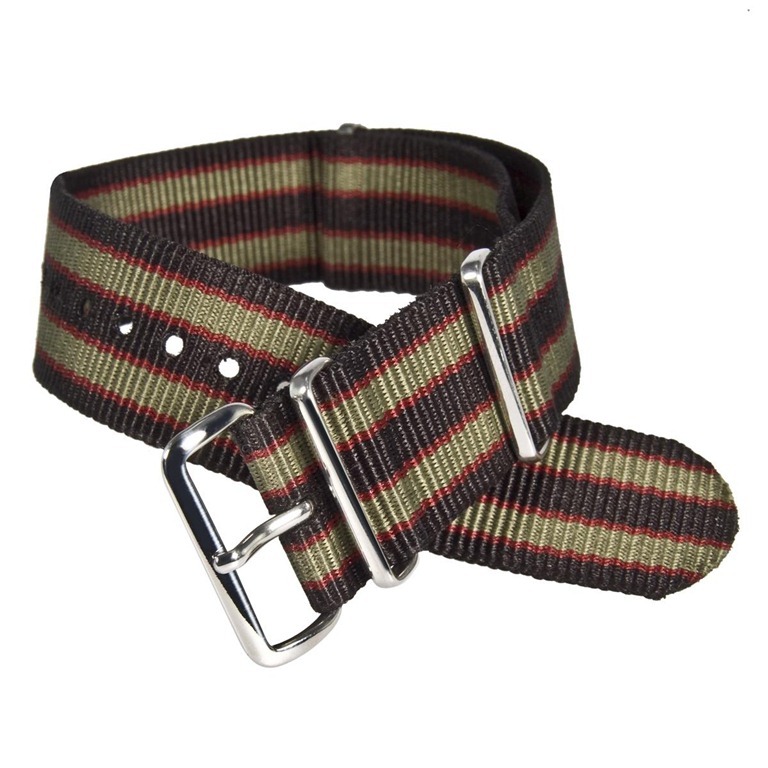 Hirsch make some of the finest straps in the world. You can spend more on a Hirsch strap than I did on the watch! Their straps include the excellent Hirsch Knight and I went down to Debenhams to try one on. 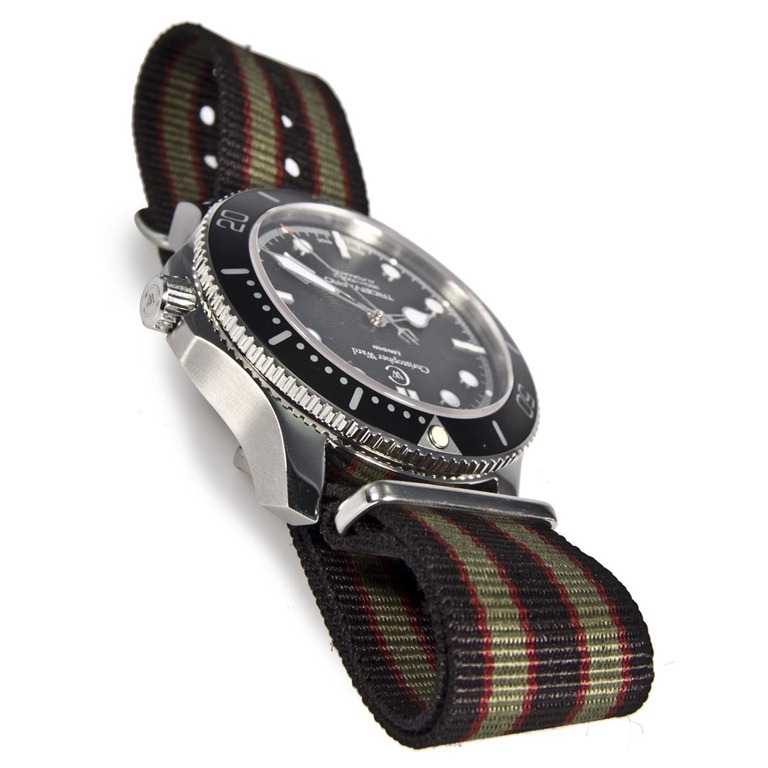 A good strap can “make” a watch and the Black Knight makes this watch into something very special indeed. I went for the black with white stitching version which sets off both the bezel and white detailing. The underside leather is waterproof mean that day to day use as well as sporting use is covered and will only need swapping out when diving. I was planning to swap on and off the CW NATO while attending Military Simulation events, but I took some shots of the look alongside some my “equipment” and I have to say I think it looks extremely good. Any fair review shows the competition to the final choice. My budget for this purchase was a total cost of around £400, but I would push the boat out for something extra special. 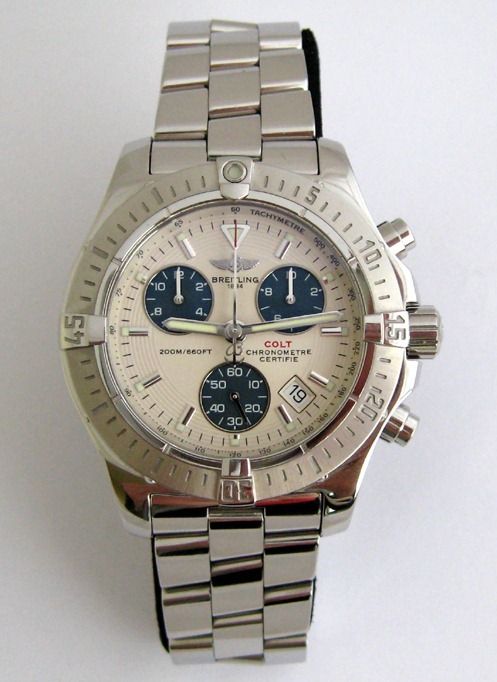 Here are the other watches I looked at that I consider the competition to the C60. 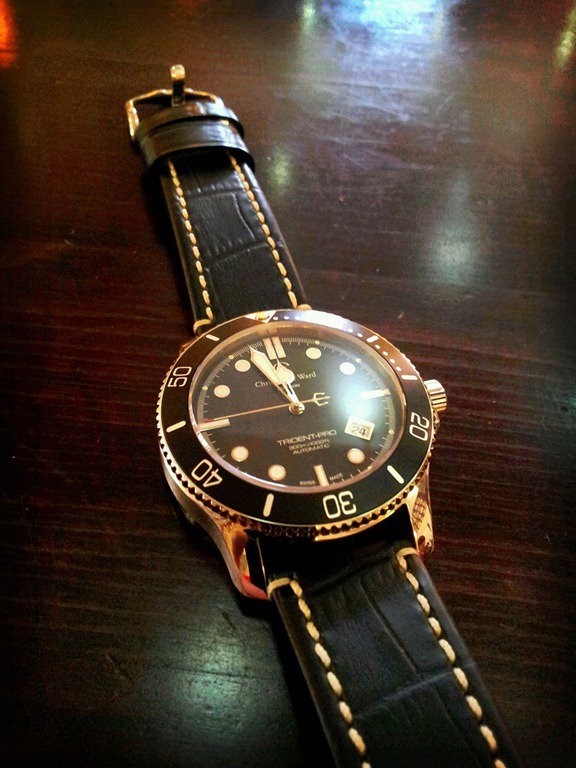 I mentioned Steinhart before and this was the model I looked at. DLC coating is all the rage these days and this watch has a solid and aggressive look which I like a lot. 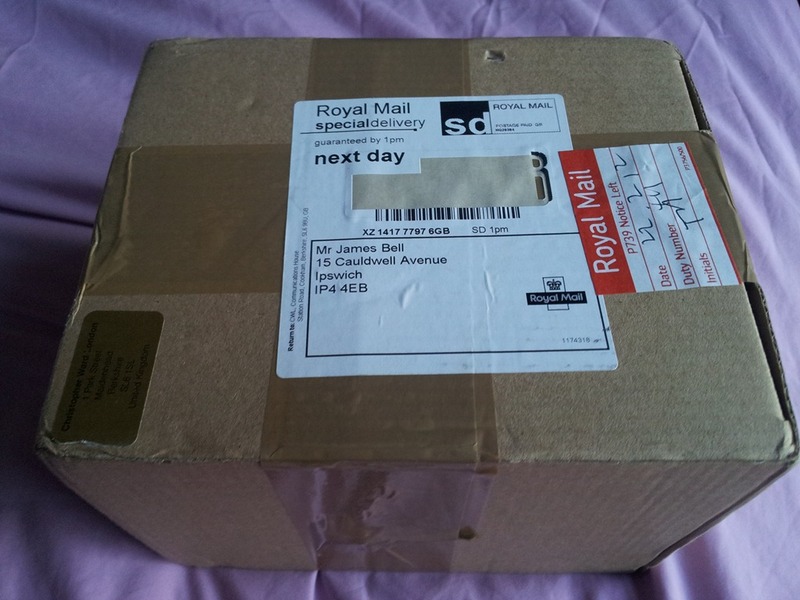 It comes in around £350 – £400 from a fine firm in Germany. Now this is nice, and British! However, I had questions regarding the reliability over time and it is priced very high for what you get. The second hand market is probably the place to get one. So, I am going to ask my SF Friend when he comes back from Afghanistan to try and get me one. You hear that Richard? This review was almost about this watch, but it is much smaller than it looks on the screen meaning it didn’t suit me. Looks good on a NATO though. It may suit some smaller wrists though and has brilliant features. £300. Well from this starting point, you are not going to get any more style points below £1000. 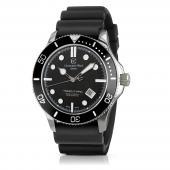 However, great watches in the £700+ bracket include the Hamilton Jazzmaster Maestro, the MKII range (if you can ever get one) and you can pick up an Omega Seamaster on EBay for around 700 notes. 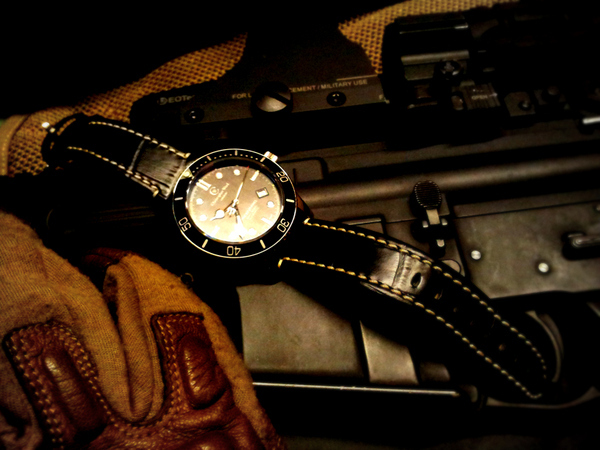 A manly watch that Bond himself would feel happy to wear. Cheap as chips considering the competition. The bezel is ever so slightly misaligned, which is common to watches at this price but always winds me right up. The date position is not perfectly in the place of the four mark, so it takes a little getting used to. Update! There is a brand new updated version of the C60.